Take a journey back to the iron-age and learn the ancient arts of metal work with blacksmith, Simon Summers. 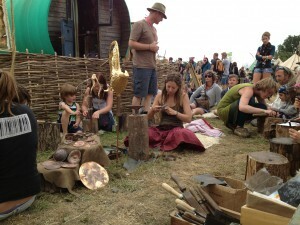 Hand craft your own tools and pendants, and use the technique of “repoussé” to create Celtic copper bangles and sacred offerings. 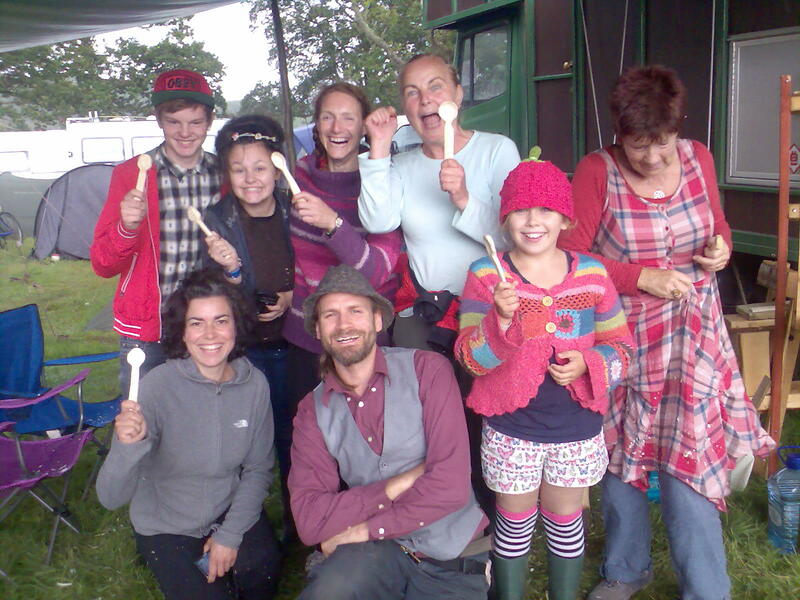 With a charcoal fired clay forge, powered by leather bellows, Oak Clan Forge invites adults and children to sit by the fire and explore their hidden potential to create ancient treasures. Repairing, recycling, adjustments and all things bicycle. Hands on workshops to show how to adjust/repair gears including hub gears, brakes and most other parts of the bicycle, info given on disability cycle issues, electric bikes, safe cycling, recycle of parts for re-use and checking for faults. Milly Peds came into creation seven years ago, developing on from my many years of mechanical experience. Among my offerings I deliver repair courses, cycle training, working with disadvantaged youth and setting up and running events. I have 20 years experience in the entertainment, environmental and educational sectors. Milly Peds will offer an info point with literature on most aspects of cycling, such as what type of bike to buy for what use, female specific issues, building crazy bikes, employment, and much more, also a small selection of recycled folding bikes, normal ones, and even vintage for sale. Burning Wood Efficiently: Principles of Rocket and Woodgas Stoves. Come and learn about the holy trinity of wood combustion: “time, turbulence and temperature”! We’ll be lighting up various rocket and woodgas stoves and discussing the simple, but ingenious principles used to harness more heat from wood (or even generate electricity!). The workshop will also touch on DIY methods and materials. A “stove anorak”, Jonathan Rouse works as a scientific advisor on efficient stoves across the developing world. Wild Stoves was founded by Jonathan Rouse in 2010. After a decade spent working with wood energy in developing countries, he thought it was about time his friends here in the UK got access to some of the fabulous devices on offer. Jonathan continues to work as an advisor to organisations ranging from the UN to small charities in Africa and Asia. The Wild Stoves Foundation was established in 2011 to raise money for select projects. Create your own tuffet. Eco-friendly and lightweight to enjoy for the festie and beyond! The “tuffet” — a wonderfully comfortable seat pad made entirely of woven wool. After in-depth research I discovered the secret of this wonderful experience of “bottom heaven”. It seems selfish to not share this comfort with friends and other like-minded people and so begins the creation of The Travelling Tuffeteer and the slogan “Bottom Heaven since 2011”. The tuffet is organic, water resistant due to the natural lanolin and is deliciously sheepy! Blacksmithing and copper bowl making with the Windy Smithy. Owned and operated by Jon Snow, who has been working with metal since 1996, the Windy Smithy operates on a semi-mobile basis from the Blackdown Hills in Devon. Originally inspired by the desire to make quality hand tools for developing communities, he went on to study Blacksmithing and Metalwork at Hereford College. The first incarnation of the Windy Smithy was a forge made from a gas bottle, powered by a wind generator. Earth Loom Weaving and Willow Dome Construction. 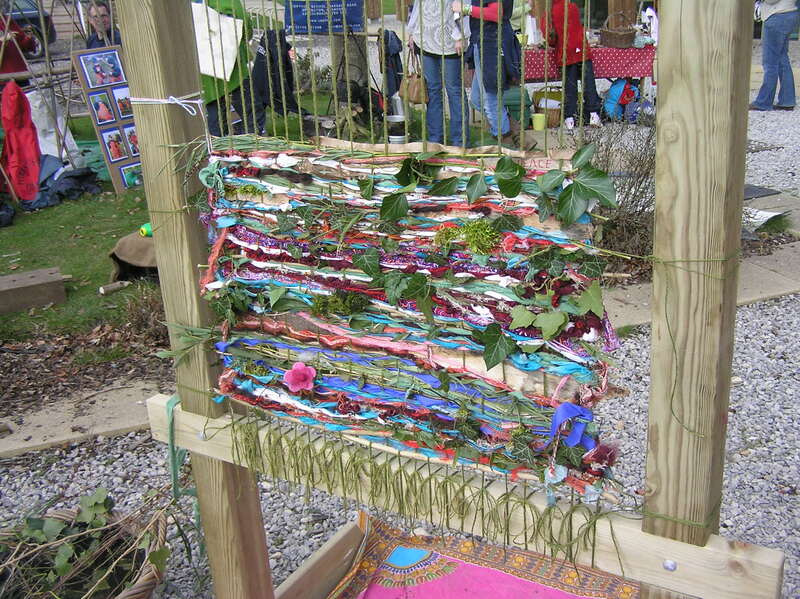 Earth loom weaving is a peaceful and creative way to connect with each other. 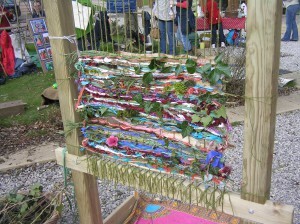 By weaving a beautiful outdoor tapestry we are symbolising the interwoven nature of community and the world around us. 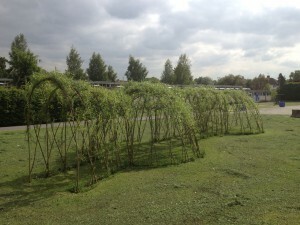 Living Willow Lincoln builds willow structures, mainly in schools and run workshops in willow weaving, green woodworking, woodland skills for children, and art based projects with the earth loom. 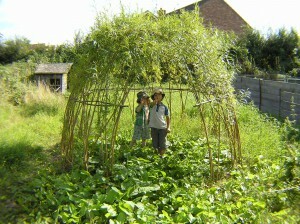 Our earth loom is a large, outdoor wooden structure, strung and ready for us to weave on. We gather natural materials from our surroundings and combine them with recycled materials that when woven together create a beautiful tapestry. We are passionate about weaving as a powerful and ancient art that symbolises the intention of weaving together the fabric of community in a peaceful and creative way that deepens our connection to nature. Practical session of cob work — learn how to make a cob mix and construct a rocket stove for cooking with at Peasants Lunch Box Cafe. Spinning, Felt Making, Natural Dyeing, Weaving and general sheep based products. Kim Creswell creates willow sculptures, hedgerow crafts & willow weaving courses. Generally made from Dorset hedgerow materials and willow cut herself, sometimes combined with willow grown on the nearby Somerset Levels. You will find that all workshops are natural crafts which do not rely on the use of fossil fuels and are appropriate to the area in which they are held. This entry was posted in Green Earth Awakening, News Headlines and tagged green crafts, workshops by Satyadarshin. Bookmark the permalink.